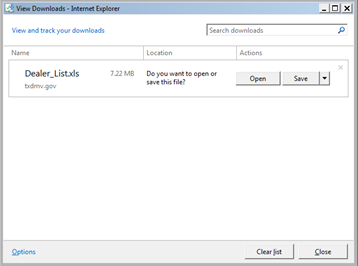 In preparation for the upcoming release of the refactored RTS, TxDMV is upgrading the current Internet Explorer (IE) web browser on your RTS workstations to Internet Explorer Version 11. Starting Friday night, April 24, 2015 and continuing nightly to May 1, 2015, TxDMV will upgrade all RTS workstations to IE 11. The upgrade will not affect workstation availability, however, all RTS workstations must remain powered on during this period. 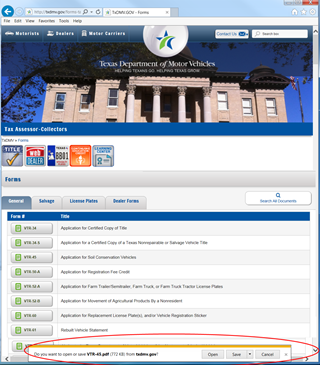 On the web page displayed when accessing forms or documents from the TAC Hub (http://www.txdmv.gov/tax-assessor-collectors), the new pop-up displays at the bottom of the page. You can Open the file to view it onscreen, Save it to a place on your workstation, or Cancel the request to open the file. On the RTS POS, when you click the Help menu and then click Dealer List, a View Downloads prompt displays that asks if you want to Open the file to view it immediately onscreen or Save the file to a location on your workstation.